There are a wide variety of pastel grounds - and I've finally got round to listing them all out in a poll to find out from pastel artists which pastel papers or pastel boards they like the best. 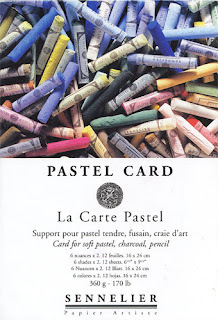 This is the link POLL: Which pastel paper or other support do you like best for pastels? 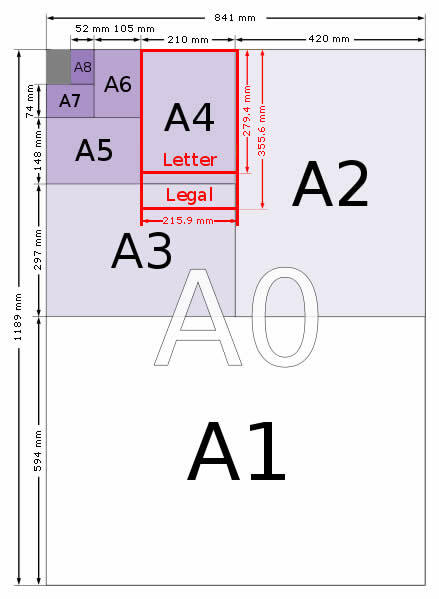 This should make it easier for people wanting to consult the site to find out which pastel ground might suit them best. let me know if I've omitted a pastel ground which should be included in the poll! This is what the IKEA ALEX Drawer unit with 9 drawers looks like for those reading the comments on my Review: IKEA Alex Drawer Unit for paper storage. This item has already found a useful place in artists' studios. a very useful item for any studio given the size of the drawers. Also has space for all those odds and sods of equipment we have to keep on hand for matting, framing etc. scope to match the Alex Drawer Unit - same depth and same design. no castors and not mobile - which means you need to find a spot and keep it there. This is a review of the IKEA Alex Drawer Unit on Castors - which is my second IKEA purchase as part of the "let's try and store everything better than hitherto" campaign. I've been storing paper for artwork and works on paper in portfolios for ages and frankly, the number of portfolios was getting very difficult to manage both comfortably and aesthetically! if big they become incredibly heavy to move when full - plus you need to start thinking about floor strength! 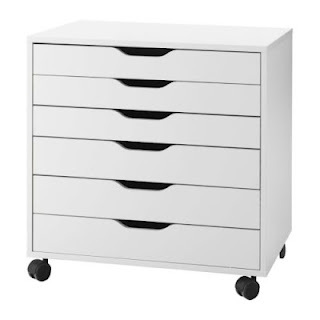 Which is why, when I spotted the IKEA Alex Drawer Unit on castors in IKEA, I was so very pleased that at long last it looked like I might have solved the problem of what to do with all that paper. The bottom line - I was right. With one caveat - I actually need two! Here's the review. Ease of Assembly: Not overly complicated however you do need 2-3 hours and to be very focused on what you’re doing while assembling it. Width: 67 cm / 26 3/8 "
Depth: 48 cm/ 18 7/8 "
Height: 66 cm / 26 "
if you’re not good at using a screwdriver or DIY find a relative or friend who is - and be nice to them! IKEA - their website http://www.ikea.com/ helps you find a store near you. 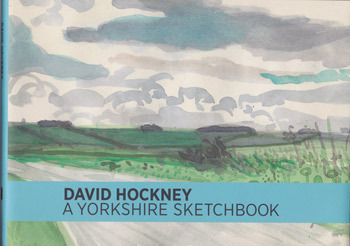 Synopsis: A facsimile 92 page sketchbook used by David Hockney in 2004 when sketching the the East Yorkshire Wolds. It contains sketches of the Yorkshire Wolds and Bridlington in watercolour, ink and pencil - and no words. Summary review and recommendation: This is a sketchbook which dates from the beginning of Hockney’s reconnection to Yorkshire and painting. Those who sketch and who like Hockney’s work will love it. Those who have never ever sketched will be very puzzled by it and may even call it a complete waste of money - but they will have missed the point. I RECOMMEND this book for those who enjoy facsimile sketchbooks. The full price version is not cheap! It’s much better value on Amazon which is where I ordered it. Those of us who sketch know the joy of looking at one another’s sketchbooks. Having this book in my hand feels rather as if Hockney has just handed me his sketchbook! I own the DVD of his sketchbooks and consequently knew exactly what to expect in terms of content and drawing style. However I do think the publishers should review the publicity profile and the description of this book on the Internet. Nowhere does it indicate clearly that this is a complete facsimile of a sketchbook used by Hockney in 2004. Sketchers who like Hockney's drawings and paintings will love this book.